If you are looking for a really lightweight cordless hedge trimmer which is extendable (telescopic) so you can reach to cut your hedges and shrubs from the safety of the ground, the HT05 Gtech Hedge Trimmer could well tick all the boxes for you. If you need something that is just that little bit more powerful, the HT04 is a great choice. Find out more about these two inexpensive trimmers below. If you have never heard of Gtech before, they are a company run from a farmhouse in rural Worcestershire but which has sold millions of products globally and has a very good reputation for quality and service. 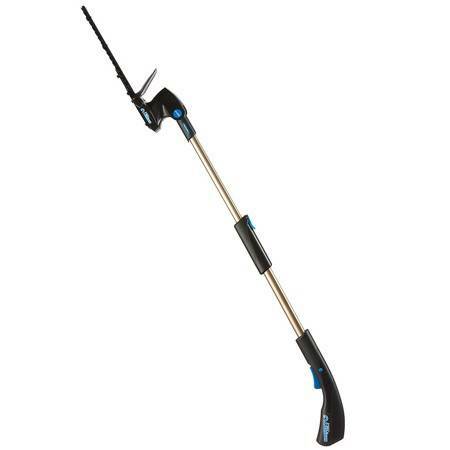 This telescopic trimmer has a maximum cutting reach of just over 140 cm (just over 4 ft 6 in) and as mentioned, reduces the need for the user to climb a step ladder to reach those out of the way places that need trimming. The Sanyo Lithium Ion battery pack is very small, environmentally friendly and energy efficient. It is integral to the handle of the machine, yet packs a lot of punch and will give you about 45 minutes of use from a full charge – making it amongst the most advanced technology available from rechargeable batteries. So what can the GTech HT05 do? It has an articulating cutting head, allowing the 23cm blades to be rotated through 120 degrees. This allows tops of hedges and shrubs to be cut and shaped with ease. It also allows for precision as the diamond sharpened blades provide neat, accurate cutting at a blade speed of up to 1,200 rpm, whether you are cutting a simple hedge or an intricate design in topiary. The machine is probably the lightest weight trimmer of its kind at only 3 ½ lbs or 1.6 kilos in weight. GTech say it is the lightest cordless hedge cutter available and it is certainly extremely manoeuvrable as well as very economical as even with the recent price rises from electricity suppliers, it probably still only costs a few pence a week to charge (figures quoted back in 2008 on the British Gas tariff said it cost less than 1p per week!). Supplied with the trimmer is the 14.4 volt lithium ion battery and charger, a quick start guide and 1 year guarantee. If you have light trimming jobs with no thick, twiggy growth or branches to cut through, the HT05 will serve you very well and get through those trimming jobs with quiet efficiency, leaving you with more time to enjoy the garden. The HT05 Gtech hedge trimmer in action! 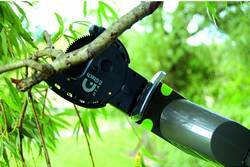 If you have need of something a bit more powerful yet still very lightweight, the GTech HT04 could fit the bill for you as it has an 18 volt battery and a branch cutter attachment, enabling it to cut through thicker twigs. The HT04’s branch cutter attachment head that has a capacity of 80mm (just over 3″) which is a really useful tool and avoids the necessity for several different cutting tools. It should cope well with most of the regular trimming and pruning jobs you need to get done in your garden. Please note, that the branch cutter is included if you look at the product page below – I have seen it elsewhere without the branch cutter for a similar price. In addition, there is a strimmer or grass trimmer attachment available separately which makes the tool even more versatile. With a powerful 18V rechargeable battery and the option of interchangeable heads, the HT04 is an invaluable tool for a huge range of trimming, cutting and pruning tasks all around the garden. The attachments are easy to affix and detach with a push button fastening. The HT04 is a little heavier that the HT05, but at only 2 ½ kilos, it is still incredibly light in weight and easy for almost anyone to uses. Like the HT05, the blades are diamond ground and 23 cm in length and can be rotated as with the HT05. They run faster at up to 1500 rpm and deliver a bit more power whilst still giving you up to 45 minutes of run time on a full charge. The battery on the HT04 is a Nickel-Cadmium one, not Lithium Ion. The telescopic reach is also a bit longer at 1.6 meters. Two great tools from GTech for anyone with a small garden who likes to keep things neat and tidy but really does not want to be climbing up ladders or lifting heavy machinery. I also like the fact that the interchangeable heads mean you really only need one tool. Whichever you choose, a Gtech hedge trimmer makes a great choice for the smaller garden. This entry was posted in Electric Trimmer Reviews and tagged Gtech hedge trimmer, Gtech HT04, Gtech HT05. Bookmark the permalink.